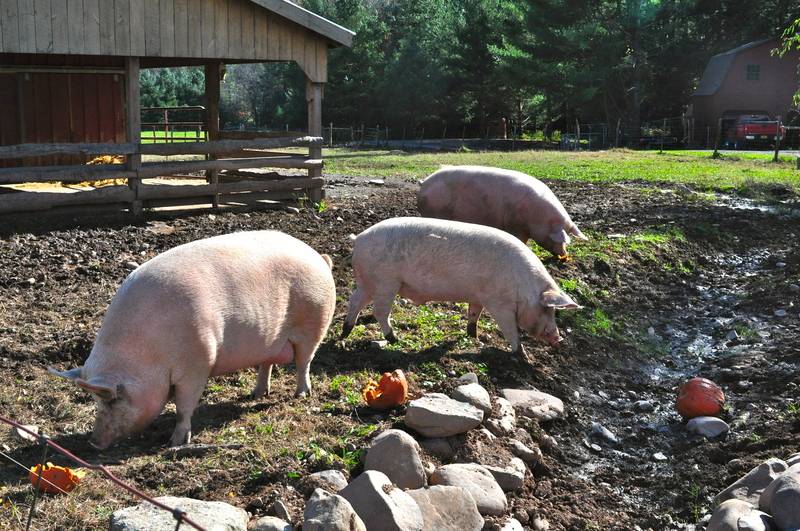 We brought Martin to the Woodstock Farm Animal Sanctuary today, in celebration of a friend’s birthday. 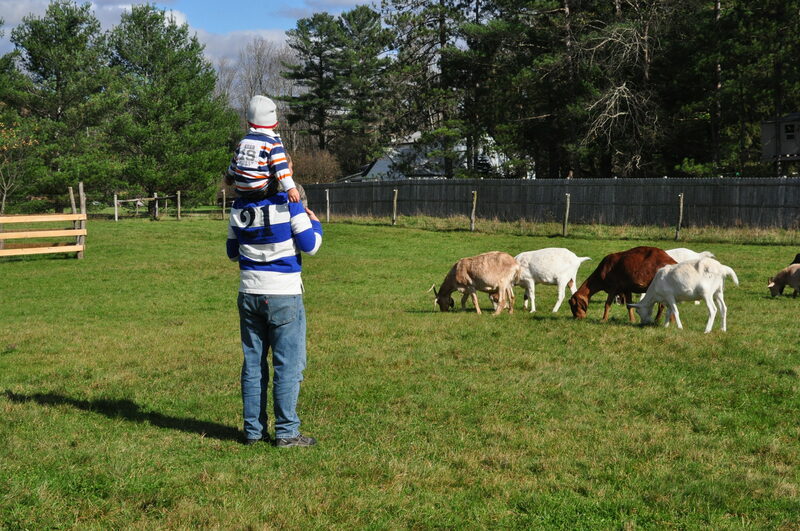 We played with ducks, chickens, turkeys, lambs, goats, pigs, and cows. Usually I love to do stuff like this, to admire animals whom society at large treats as commodities for food/clothing/additive production. It’s more difficult now, of course, because Martin is eating meat. Merriam-Webster defines a vegan as “a strict vegetarian who consumes no animal food or dairy products; also: one who abstains from using animal products (as leather).” Abstaining from using animal products entirely is, more or less, impossible; living in this world demands using products made by others, and too many of those products—film, computers, pain relievers, wines, McDonalds French fries—contain, or are manufactured with, animal parts for one to avoid them. But for many years I’ve done pretty well, at least on the big stuff: meat, eggs, dairy, leather, wool, and so forth. For the most part, I’ve avoided the stuff you really cannot have without using animals. Not anymore. How can I press my forehead against a steer’s and stroke his muzzle, when this morning Martin ate leftover hamburger with breakfast? How can I allow a turkey to nestle between my shins, when our car contains a Thermos of turkey-neck broth? I’m glad that we’re managing Martin’s dietary changes without resort to caged, agribusiness animals. I’m glad I’ve visited the farms where his meals grow and die and observed that, other than the part about being slaughtered early, their lives aren’t that different from those of the sanctuary animals. I’m satisfied that, as Adrian remarked this morning, we’re using meat for a distinct, defined purpose (dense protein and easily digestible fats to hasten Martin’s recovery) and not out of laziness, or like a celebrity chef determined to sample as many varieties of flesh as possible, only for the sake of doing so. Beyond those comforts, I’m still having trouble navigating the decision. I need to envision an end-point, when this chapter closes and Martin, recovered, returns to being a vegan. I know he may not always stay that way; as he matures he’ll make his own choices. Still, I can try to point him in the direction our family prefers, which I don’t feel I’m doing at the moment. As for right now, I need to find a way to apologize to all these animals. I’ve decided to add the money we spend on Martin’s ghee, eggs, honey, and meat and send an equal amount to a farm sanctuary with outreach/education programs. It’s a start. Kind of. This entry was posted in Deep Thoughts by findingmykid. Bookmark the permalink.